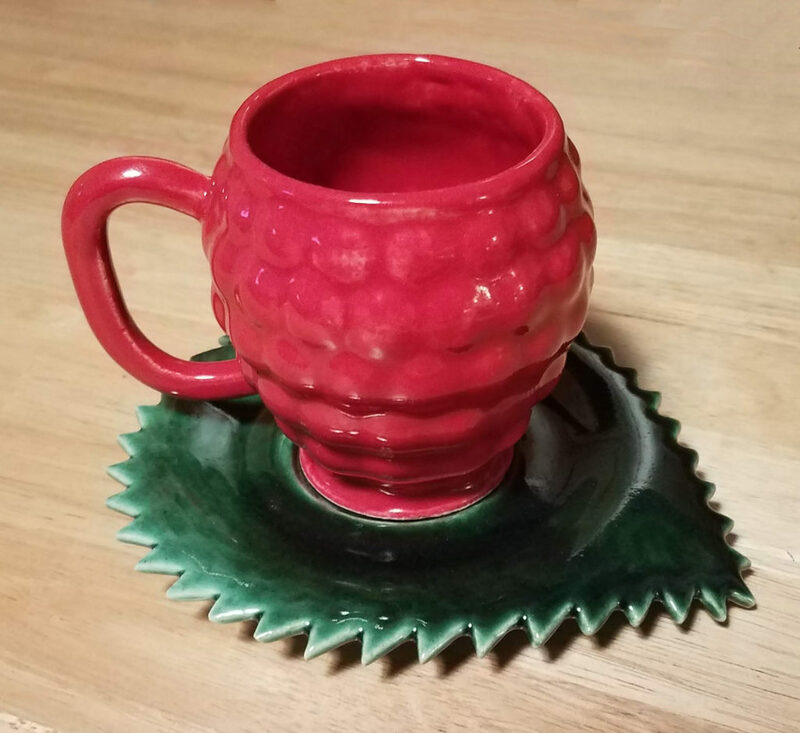 My mom collects teacups, and I liked the idea of creating one using 3D tech. She also grows raspberries in her garden – eating them off the vines is always a treat when we visit in the summer. 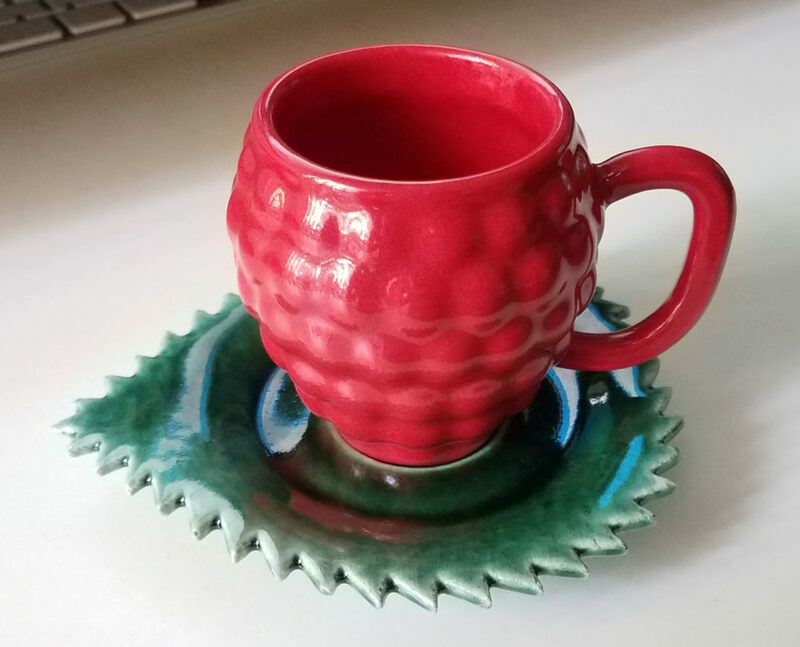 I was mulling over ideas for a raspberry teacup design when the idea struck of using a raspberry leaf as the saucer. Then I started in earnest. This is perhaps an afternoon project for an experienced ceramics artist. But I’m more fond of CAD then wet clay, so I designed it in Fusion 360, and had it fabricated with Shapeway’s porcelain process. 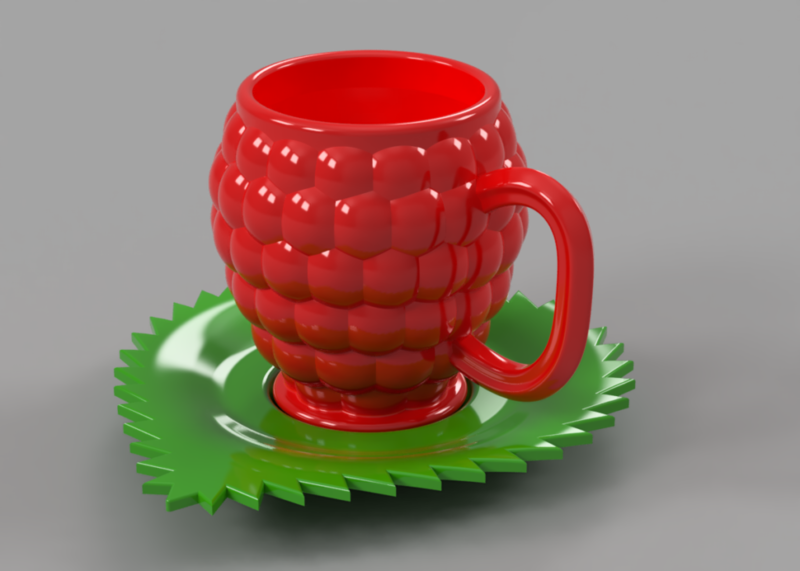 I started by taking a generic looking teacup and making a bunch of measurements on it. 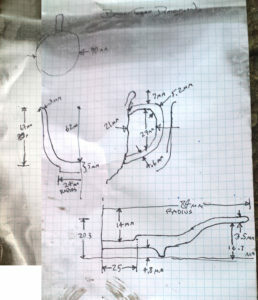 My notes were covered in soot after the fire, so I worked from photos of the graph paper. Turns out there’s a lot of basic measurements you need to hit: the rim of the saucer must come up enough to comfortably get your fingers under it, the base for both saucer and cup is a circular rim (a solid flat area increases the chance imperfections will make it wobble), the handle must accommodate your fingers, etc. The cup is simply stacks of concentric overlapping spheres, with the interior carved out by a surface of revolution. The saucer was a bit more work; I wound up writing some Python code using Fusion360’s API to cut out the serrated leaf edge. Shapeway’s ceramics process has rather strict size limitations, and the original saucer wouldn’t fit in the maximum build space, so I made the set about 20% smaller to fit. That’s what’s pictured above. The narrow end of the cup wasn’t terribly stable, so I added a wider base to compensate. The tip of the larger saucer drooped a bit during fabrication, so I’ve since added some support ribs underneath to hold it up. Alas, it appears the couple of cups I made may become rare collector’s items. All of the large 3D printing companies (Shapeways, Scuplteo and i.Materialise) offering 3D printing in ceramic discontinued this service. If anybody knows of a straightforward service for small-quantity 3D ceramic prints, please post a comment! I finally got a chance to photograph the actual cup with the wide base. As you can see, the saucer drooped a bit in firing. A new saucer has been made. Posted on February 10, 2018 by jp. This entry was posted in 3D. Bookmark the permalink.